Proper feeding of infants and young children can increase their chances of survival. It can also promote optimal growth and development, especially in the critical window from birth to 2 years of age. Ideally, infants should be breastfed within one hour of birth, breastfed exclusively for the first six months of life and continue to be breastfed up to 2 years of age and beyond. Starting at 6 months, breastfeeding should be combined with safe, age-appropriate feeding of solid, semi-solid and soft foods. An infant that is not exclusively breastfed could be at a substantially greater risk of death from diarrhoea or pneumonia than one who is. Moreover, breastfeeding supports infants’ immune systems and may protect them later in life from chronic conditions such as obesity and diabetes. In addition, breastfeeding protects mothers against certain types of cancer and other health conditions. Adequate feeding from 6 months onwards can prevent undernutrition and decrease the risk of infectious diseases, such as diarrhoea and pneumonia. Yet despite all the potential benefits, only about two fifths of infants 0-5 months of age worldwide are exclusively breastfed, and slightly more than two thirds are introduced to solid foods in a timely manner. Analysis of data on feeding practices among infants and young children highlights the need for accelerated programming in this area. Globally, only 42 per cent of newborns are put to the breast within the first hour of birth, and only 2 in 5 infants less than 6 months of age are exclusively breastfed. The data show that less than three quarters of children aged 12-15 months are still breastfeeding. The World Health Organization (WHO) recommends that this practice continue until age 2 and beyond, yet less than half of young children aged 20-23 months are benefitting from it. Global estimates for feeding of children aged 6 months to 2 years indicate substantial room for improvement. A little more than two thirds of 6-8 month olds are receiving any solid food at all, and when considering measures of diet quantity and quality, the rates are much lower: only 1 in 2 receive a minimum meal frequency and 1 in 4 a minimum diet diversity. Levels of recommended feeding practices vary widely among regions. The share of infants that are breastfed within one hour of birth ranges from around 40 per cent in West and Central Africa and South Asia to about 65 per cent in Eastern and Southern Africa. In terms of continued breastfeeding at 2 years, the range between regions is wide: the rate of continued breastfeeding at 20-23 months in South Asia is 4.3 times higher than East Asia and Pacific. For minimum diet diversity, somewhat similar rates are observed across regions. Compared to about 1 in 5 children 6-23 months old in Eastern and Southern Africa and South Asia, about 1 in 4 children in West Central Africa receive minimum diet diversity. 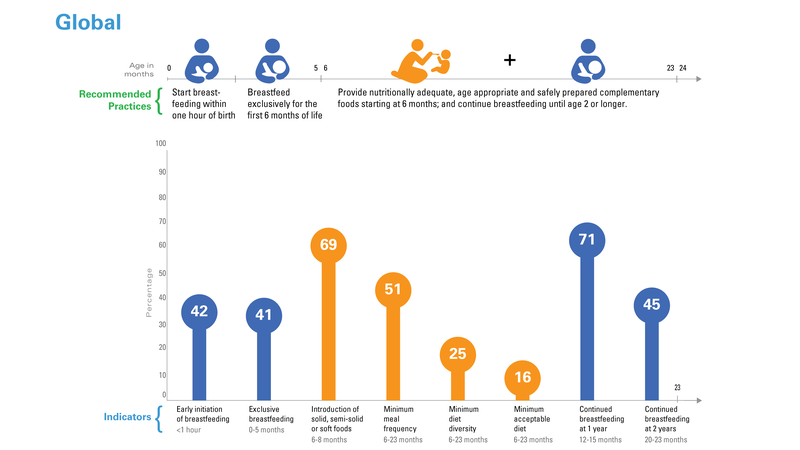 Per cent of children put to the breast within one hour of birth, exclusively breastfed (0-5 months), receiving solid, semi-solid or soft foods (6-8 months), with a minimum meal frequency, minimum diet diversity and minimum acceptable diet (6-23 months) and continued breastfeeding at 1 year (12-15 months) and 2 years (20-23 months), global, 2017*. Source: UNICEF global databases, 2018, based on MICS, DHS and other nationally representative sources. Note: Data included in these global averages are the most recent for each country between 2013-2018. Progress to improve exclusive breastfeeding has stagnated over the past 15 years. Five out of the seven regions with trend data have current rates at around 30 per cent, and all of them have improved very little, if at all, in more than a decade. The rates of exclusive breastfeeding in Latin America and the Caribbean and in East Asia and the Pacific, for example, have remained unchanged since 2000. Global rates have improved modestly, seeing an increase of only 7 percentage points in the last 15 years. 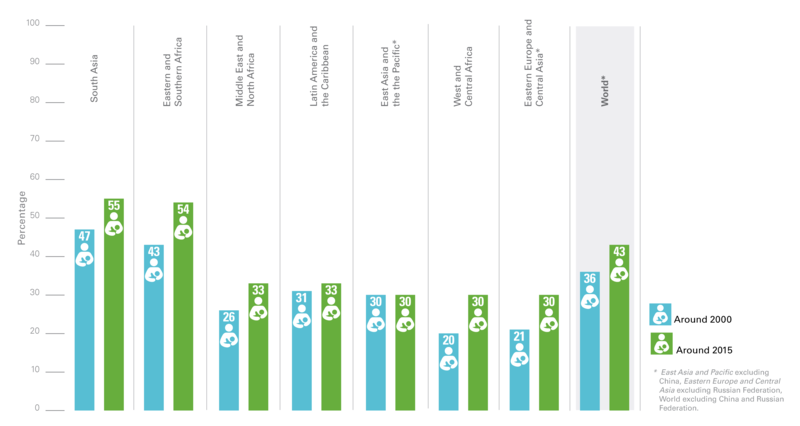 Only two regions, Eastern and Southern Africa and West and Central Africa, have increased exclusive breastfeeding rates by ten percentage points or more during this time period. Source UNICEF global databases, 2016, based on MICS, DHS and other nationally representative sources. Notes: Analysis is based on a subset of 78 countries with comparable trend data covering 68 per cent of the global population (excluding China and Russian Federation) for around 2000 (1997-2003) and 70 per cent for around 2015 (2010-2016). Rates around 2015 may differ from current rates presented elsewhere as trends are based on a subset of countries with baseline data. Regional estimates are presented only where adequate population coverage (≥ 50 per cent) is met. * To meet adequate population coverage, Eastern Europe and Central Asia does not include Russian Federation and East Asia and the Pacific does not include China. As infants grow, their nutrient needs grow with them. After the first six months of life, an infant’s nutrient demands start to exceed what breastmilk alone can provide. To keep up with these growing demands, WHO recommends that infants begin eating solid, semi-solid or soft foods at 6 months of age to ensure that their nutrient intake is sufficient to fuel their developing brains and bodies and thus indicators related to consumption of solid, semi-solid and soft foods become increasingly important to track. While it is recommended that infants start eating solid foods at 6 months, globally, about one third of infants 6–8 months old are not yet eating solid foods, posing a threat to their growth and development. The situation is most troubling in South Asia, where about half of infants are being introduced to solid foods too late. While infants and children are the youngest members of their families – proportionally, their nutrient needs are the greatest. In fact, the nutritional needs for growth and development in children 6-23 months of age are greater per kilogram of body weight than at any other time in life. Frequent feeding of a variety of foods is therefore important to help ensure nutrient needs are met. In the graphic below, we summarize data about minimum meal frequency, minimum diet diversity and minimum acceptable diet among children 6-23 months of age (see notes on the data section for further details on these indicators) among a subset of 64 low- and middle-income countries with comparable data for each of the three indicators. Less than half of all children aged 6-23 months are not being fed even a minimum meal frequency and only one fourth are fed a minimally diverse diet comprising at least 5 out of 8 food groups in the previous day. Together, when considering both minimum meal frequency and minimum diet diversity, only about 1 in 6 children are receiving a “minimally acceptable diet”. When considering which segments of society are affected most, disparity between richest and poorest is stark, especially for minimum diet diversity. In any case, even the richest are not doing very well when it comes to diet diversity indicating efforts are needed to improve diets of infants and young children among all segments of society. The standard indicators for infant and young child feeding practices were developed in alignment with WHO’s Guiding Principles on feeding the breastfed and non-breastfed child. The aim is to use the guidelines to assess infant and young child feeding practices within and across countries and to evaluate progress in this programme area. While it is not possible to develop standard indicators for all desirable and recommended practices, 15 indicators (8 core and 7 optional) were developed and are presented in WHO’s 2008 publication, Indicators for Assessing Infant and Young Child Feeding Practices. Part 1: Definitions. These indicators are a culmination of six years of inter-agency work and are used to assess a subset of practices. This set of indicators provides i) an update of the 1991 WHO and UNICEF indicators on breastfeeding practices and ii) a broad set of indicators to assess, for the first time, feeding practices in children aged 6 to 23 months. Data for these indicators are collected through household surveys. With the exception of early initiation of breastfeeding, they are based on questions about liquid and food intake of children aged 0─23 months in the 24 hours preceding the survey. Standard questions and other practical methodological instructions for the core and optional indicators are available in the WHO document, Indicators for Assessing Infant and Young Child Feeding Practices. Part 2: Measurement. Large household survey programmes, such as MICS and DHS, are major sources of country-level estimates for seven of the core indicators as well as a subset of the optional indicators. Other national household surveys, such as national nutrition surveys, often include questions used to report on these indicators as well. These dimensions include continued breastfeeding or minimum milk feeds, appropriate timing of introduction of solid, semi-solid and soft foods, as well as optimum quantity and quality of foods consumed. Note that continued breastfeeding at 2 years (20─23 months) is an optional indicator, but is included in UNICEF’s global database.